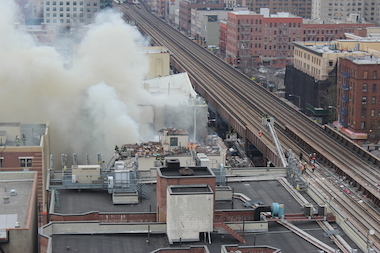 Smoke from the explosion at East 116th Street and Park Avenue March 12, 2014. EAST HARLEM — Two owners of a business damaged by the building explosion on Park Avenue and 116th Street last year must pay back their emergency loan because their store couldn’t stay open long enough. Kadia Ba and her business partner Sabrina Saadaoui waited more than six months to get a loan from an emergency fund set up after the 2014 gas explosion that killed 8 people. The state established the fund in August 2014, and the business was given a $7,500 loan on March 20. One of the conditions of the loan was that the business had to stay open for at least six months. The Sahara Boutique closed in July, according to the Upper Manhattan Empowerment Zone, the organization that distributed the funds. “Under the terms of the loan because the business closed in less than six months the loan will have to be repaid by September for 2016,” said UMEZ spokesman Bob Liff. They were the first people to receive the “Emergency Loan” that Governor Andrew Cuomo announced nearly a year ago. The $335,000 fund was put together with money from the Empire State Development Corp., the Harlem Community Development Corp., the Upper Manhattan Empowerment Zone and State Assemblyman Robert Rodriguez. On July 22, George Lizzano, the owner of Lizzano Realty, became the second business owner to receive what is now being called the “East Harlem Business Recovery Convertible Loan,” by Rodriguez. “It’s a shame because it won’t do much,” he said in Spanish. His accounting business, which faces Park Avenue, was closed for two months after the explosion as crews set up a makeshift cleanup site by front of his door. His rent is $2,500 a month and he ran up a $28,000 credit card debt to keep the business afloat, he said. Lizzano lost his SUV, which was parked directly in front of the church minutes before the explosion. The roof from his store collapsed on him after the blast, sending him to the hospital and forcing him to spend four months in physical therapy and six months sleeping sitting down because his neck pain, he said. Two more businesses — the Urban Garden Center and D’Amore Winebar — are set to close on their loans in the near future, according to State Assemblyman Rodriguez’s office. They are expected to receive $20,000 and $7,500, according to a Rodriguez spokeswoman. Dimirti Gatanas, the owner of Urban Garden Center, said he would like to have received more money but is happy with whatever the state gives him. Even though it took longer than some people expected, the fact that the state was able to put money together to help local small businesses is appreciated, Gatanas said. Emergency funds will likely go toward the rent and insurance, he added. “I urge UMEZ to promptly disburse these loans so that these businesses can be made whole again,” Rodriguez said in a statement. UMEZ said there are eight more businesses in the pipeline but declined to say which ones because nothing has been signed. “If and when we finalize future loans, we will make that information public,” Liff said.